The jar says 1 teaspoon powder in 3 ounces of water, I tried that. It was not delicious. So I tried a second shot with 1 teaspoon powder in 3 ounces of tart cherry juice, that was acceptable. By 3 ounces I mean that I measured a third of a cup. 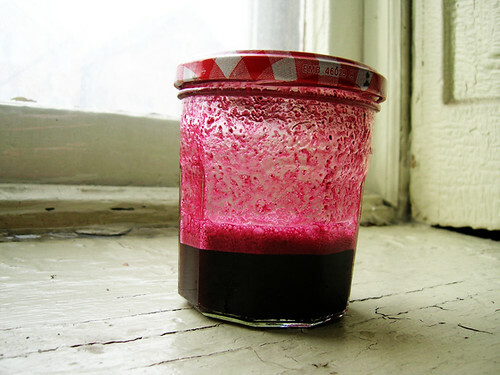 Be warned, the powder is dehydrated beet and doesn't exactly dissolve into juice; you can feel it on your teeth. Since I just downed two teaspoons of beet powder and haven't hulked out, I might play around with that plus 1/3 cup water and 1/3 cup tart cherry juice in my rocket blender. Meh. It goes down in three seconds, it doesn't really matter. Otherwise it works fine to use a bonne maman jar and its lid, which I have like a hundred of. ETA: Woah, maybe this stuff actually works? From what I've read, like, creatine has a cumulative effect, you build it up in your muscles over time, but beet juice has more of an immediate effect, it goes to your bloodstream and is at work in 2–3 hours, well, I downed a tablespoon of beet powder blended in 1/3 cup each water and tart cherry juice before my two clients and Second Wind practice this Tuesday, and I felt, idk, less hopeless when I jammed. Like natural born jammers, you know how they hop around and you look at them like, where do you find the energy. I'm more like a thrilla in manila jammer, I let myself get pummelled and plow through. Tuesday, though, I was dancing a bit. HM. ETA: Ahh but, Kristen at work has an actual juicer and now and again I get little samples from that, yesterday she had beet juice and like I can get this beet juice from powder down, but the fresh beet juice is actually delicious. Aagh. Now I want a juicer. Blend all ingredients together in a rocket blender, then throw it down the hatch.